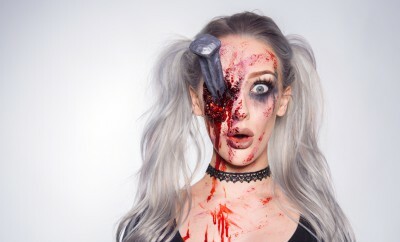 Elli chops her fingers off so you can create a great gory effect for halloween this year. A fairly easy to create effect, but make sure you prepare all your tools before you begin, cause you’ll be one handed. You should have painted the bony protrusions with a brown yellow mix to give it more realism. I would make the bone thicker than that, though. Hi, just wondering, is there something else than skin adhesive. Thank you . Much Appreciated. +ellimacs sfx makeup Thank you very much. you said something in polish omg 😍 were are you from? Hey can you do a full body Sfx makeup maguey in two parts? where can i buy this wax?